However, I want to talk about exercising your creative muscles. I really don’t exercise my physical muscles as much as I should, but people forget that while writing isn’t really physically demanding, you do need to do a lot of work in it, as well. So, what do I mean by pushing yourself to the limit? A few examples of how I pushed myself in the past will be in order. The first time was when I was still writing the Line of Corruption. This was maybe late 2011, or early 2012. I was writing a massive battle, and it was honestly the first time I’d written something like it. I’d written huge battles before, but it was the first time where the impact of the results affected the main characters so strongly. In order to keep up the pace and momentum, I wrote it like a reader would read it. Nonstop. I wrote eight thousand words in one sitting. The next day I wrote four thousand words, and on Saturday, I wrote another four thousand words. That was how I ended Part I of Line of Corruption. I was creatively drained afterwards. Didn’t write a word for maybe a week. But I was done with Part I. It clocked in at around 53k words. Writing eight thousand words is not as difficult as I assumed before I wrote it. It’s really a question of whether or not you want to persevere. See, the reason why we normally don’t write ten thousand words in one sitting is because you will probably hit a creative wall. And there are two things you can do. 1. Call it a day, and see if you can scale the wall tomorrow with the proper equipment. 2. Channel Jackie Chan, and try to jump over the wall and hope for the best. So, there’s your first example of when I pushed myself. Second example is when I wrote Radio Silence. I was preparing for NaNoWriMo, and I had a cool idea for a horror story. So, I just wrote the first four thousand words in one sitting. It’s not as impressive, I guess, as the part with Line of Corruption. But I did push myself because I had no idea what I was going to do with the story. So, what the next hundred words was going to entail was a mystery to me until I was literally a dozen words away from writing it. That’s how I did it. And it worked out. Then, around January, I pushed myself again with an Urban Fantasy story. I wrote five thousand words in one hour. I was chatting with my friend at the time, and every time I wrote a thousand words, I’d send him a message challenging him to beat it. I liked the story a lot, but I made a lot of mistakes. Mostly with verb tenses. I’d written it in first person perspective, and I hadn’t written anything like that before. I think I may have deleted it, but I may have it on a forum I made with some of my writer friends where we can post our writings and critique each other’s work even when we’re not online on Skype. The point is, pushing yourself as a writer is never really a bad thing. Sure, you make a lot of mistakes along the way, and I certainly wrote some pretty incomprehensible things while I was pushing myself, but it’s at times like that when you can test your determination. You get to see just how stubborn you are. I’ll most likely set out an hour tomorrow so I can write Chapter 6 and 7, and as a bonus, I’ll make a video of myself writing it. A few months ago, I learned how to record my computer screen by using this program, Screenflow. So, prepare yourself for a video after I post Chapter Five and Six. You’ll see a lot of deleting, terrible punctuation errors, and massive factual errors. I know, sounds like a lot of fun. It’s really a video for the people that are most interested in how I write things (yes, all ten views will be myself re-watching it to see all my mistakes), and I’ll most likely speed up the video on Final Cut Pro X so it isn’t so dreadfully long. Hope you’re looking forward to it. When have you pushed yourself as a writer? I’d love to hear your stories down in the comments, and I bet they’re a lot less mistake-filled as mine. Have a cool day. As some of you may know (since I’ve been screaming it from the rooftops), I’ve been serialized. I’m really quite glad about this, but I’ve been getting used to what being serialized actually means. It means being consistent and writing on a schedule. You don’t actually have to follow a schedule. You can post chapters whenever you feel like it, but I prefer sticking to a schedule. I post a new chapter on Friday for three weeks. No chapter on the fourth week because that’s a bit too much, even for me. I used to write whenever I wanted to, and that actually worked quite well for me. Now, I have to be able to write a whole lot within a week so it can be edited properly before getting published. It’s honestly a dream come true. I like the fact that I now have people looking forward to reading the next chapter of my story. It makes me try a lot harder, and I’m currently working on something for a chapter in Radio Silence’s future where I do something really experimental. So, I will most likely be writing a lot more vigorously so I’m at least two to three chapters ahead of everyone. Chapter 4 of Radio Silence has already been written, and I’m working on Chapter 5 now. It was really cool to suddenly start writing on a schedule because it made me feel like a bona fide author. It also gave me some perspective on the problems some authors have when writing. I’ve seen and read the complaints of people when a writer can’t reach his/her deadline and isn’t able to get the book out in time (I was one of them, most of the time), but until now, I never realized just how hard it may be for a lot of them. Like I said, I am far from a professional writer. Yet, I have been writing in the mindset that with a single sentence, everything could come crashing down around me. I didn’t have this feeling with the Line of Corruption because I felt safe with the knowledge that any mistake I made would be spotted and fixed long before it was ever published. 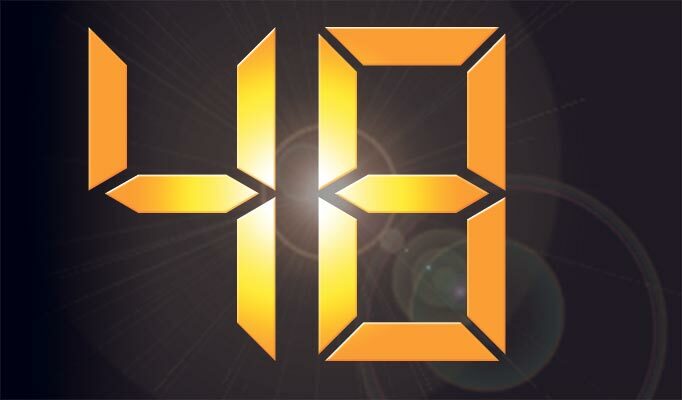 Now, there’s a week – two weeks, maximum – before a chapter of Radio Silence is posted. I reread each chapter about five times, even after it’s published. But, I always keep in mind that each chapter has to be at least as good as the last one, and it would be great if each one is better than the previous ones. That’s how I write my chapters lately. It forces me to write beyond what I thought was my limit. I constantly come up with ways to make each chapter substantially better by trying out something I would never have imagined when I was writing the Line of Corruption. So, really, this post is more about how cool being serialized is… and why I think that it’s cool, even with the dangers. One thing I’ve enjoyed immensely since I started writing Radio Silence itself is finding new songs. As some of you may know, each chapter of Radio Silence is named after a song, and while I write that chapter, I listen to that song on repeat. Eating healthily, and exercising regularly. Take that to the press. So, anyways. Those are my thoughts on writing on a schedule. I know it’s a really short post in comparison to my old posts, but I hate to try to drag things out to a thousand words when I can easily say it within 700. So, hope you’ve enjoyed this post. This was really a post telling other writers that if they’re afraid of the whole serialized thing… it isn’t bad at all. I love them. I love seeing people comment, I love discussing things with people that disagree with something I’ve said (granted that s/he approached it in a civil manner). And if possible, I try to reply to comments as fast as possible. The people that voted for Radio Silence, for example, have also taken the time to pass on their compliments in the comment sections. This is something that I really appreciate, and it was a lot of fun to read their praises and compliments. I was originally going to talk about comments in general, i.e. on places like Youtube, Rotten Tomatoes. All the usual suspects. I was planning on talking about those people that comment derogatory statements that (normally) make no sense at all, and generally ruin the pleasure of reading the comments for everyone. But, considering I don’t really have a lot of experience with that kind of thing (fortunately), I’m just going to talk about what I do know. Which is the satisfaction of reading other people’s opinions. Earlier, I wrote a post about drafts that a few people disagreed with, but I honestly didn’t mind them disagreeing with my views on them. I was pleasantly surprised by it, and I had fun replying to their comments. I’ve also written posts where people agreed with me, and I of course enjoyed reading about those. But, a buddy of mine has told me that the reason why most of his readers don’t comment when they disagree is because they’re afraid the blogger and her/his followers will just rip them apart. Now, I find this very interesting. See, to an extent, it is actually a reasonable fear. If we’re talking about Youtube (for example), and the subscribers of this person are very… loyal. It’s a normal occurrence. But, it was interesting to hear that people even fear this on intelligent blogs. I think that it’s sad that this happens, so I decided to write an entire post about it. If you disagree with me, please comment about it. As long as you say it in a relatively civil and intelligent manner, I am completely okay with it. I’d be happy to find out why you think I am incorrect, and if your reasons are all right, you may even sway me. So, just thought I had to get that out there. I don’t think I have to say that it’s cool to comment that you liked what I’ve written, since I think everybody likes to hear that. I hope that people will continue to comment in my future posts whether or not they agreed/disagreed with the point I made in a post, because I honestly find the opinions of others very enlightening. 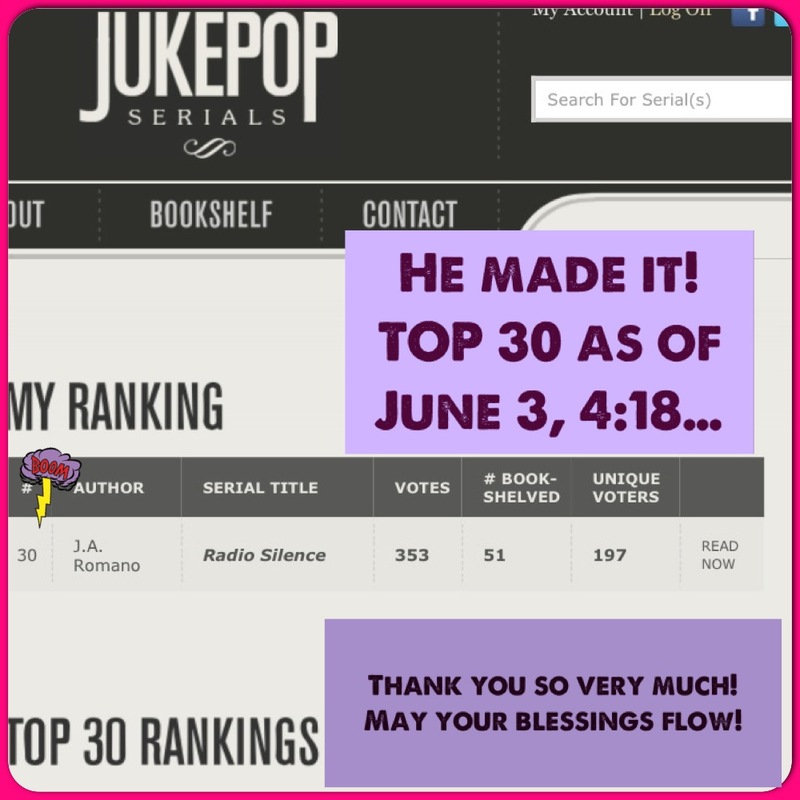 Radio Silence is in the Top 30 of Jukepop Serials! I dropped my pencil and rushed over to see if it was true. And it was! Because of the amazing support of my family, their friends, and the friends of their friends, and the people I’ve gotten acquainted with since I started blogging… I made it. 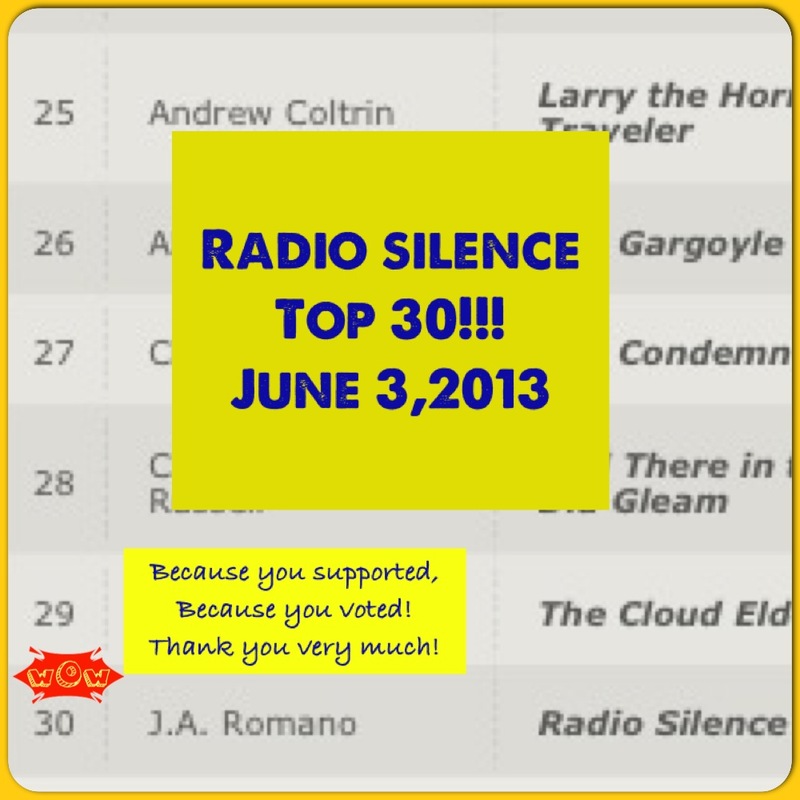 Radio Silence is in the Top 30 with 353 votes. To bring perspective into how momentous this is, I was able to get to the Top 30 in roughly four weeks. And before Radio Silence, the fastest anyone was able to get to the Top 30 had been five weeks. I was – and still am – amazed when this happened. I started pacing from one side of the room to another. I could not contain my excitement. This marks one of the few times where I cannot find the proper words to adequately describe how I felt when I found out. Despite this, I still have a ways to go. It would be quite possible for me to be dethroned from the 30th position within a day or a week. So, it would still be a great favor to me if you – the reader – would take the time to vote for Radio Silence. You can also find the links to all the chapters here. Still, I am just as happy as I can possibly be right now. Thank you to everyone that voted for me, and thank you to everyone that helped Radio Silence be the 30th most voted serial in Jukepop Serials, and the second most voted serial in the entire Horror genre. I could tell you all about Scrivener’s features, and I most likely will, but I’ll just tell you what I think about it. First, I’ll start with why I started using Scrivener in the first place. I’d reached a hundred thousand words in the Line of Corruption. It was a momentous occasion, but it also brought a problem. Word count. For some reason, my Word malfunctioned, and I couldn’t find out the word count anymore. I know I reached 100k because I was at 99,997 words when I was suddenly unable to find out the word count. So, after a quick shout out on a forum, some alternatives were recommended. Then someone recommended Scrivener to me. I was… skeptical about it. I was inclined to believe that it was great, but at the same time, all those praises didn’t sound very real to me. So, I got the trial version, and I transferred LoC into it. At first, I was a bit amazed by it. And then I was even more amazed. See, I was using a 2008 version of Word (mostly because I always neglected to update it), so I was using a rather antiquated version. At least in comparison to the versions we have now. So, when I opened Scrivener, and found out I could essentially compile my entire book into whatever format I wanted – Mobi, Pdf, ePub… I blacked out. So, that’s one of the best features. The next feature is simply the organization of it all. When I found out I could put chapters into folders within the same document ( a feature most likely available in plenty of other programs, but it was the first I’d seen of it ), I blacked out. Again. With joy, obviously. So, I made three folders. Part I, Part II, and Part III. Each part has over twenty chapters or so. Well. That doesn’t seem very organized, but you should’ve seen my Word document. Not pretty. Not pretty, at all. I also had the option of downloading pdfs for research and putting it within the same document. This feature is severely underused by me since I normally just bookmark it on Safari, but I normally compensate by using it as a textbook for all the magic systems, and mythical creatures I’ve made up over the course of writing the book. It actually unlocked a few more features of Scrivener that I was disappointed to see had not been available in the trial version. I can see why they would leave it out, but I probably would have bought it within two days of getting the trial version if I had access to some of the premium stuff. But yeah, that’s business. 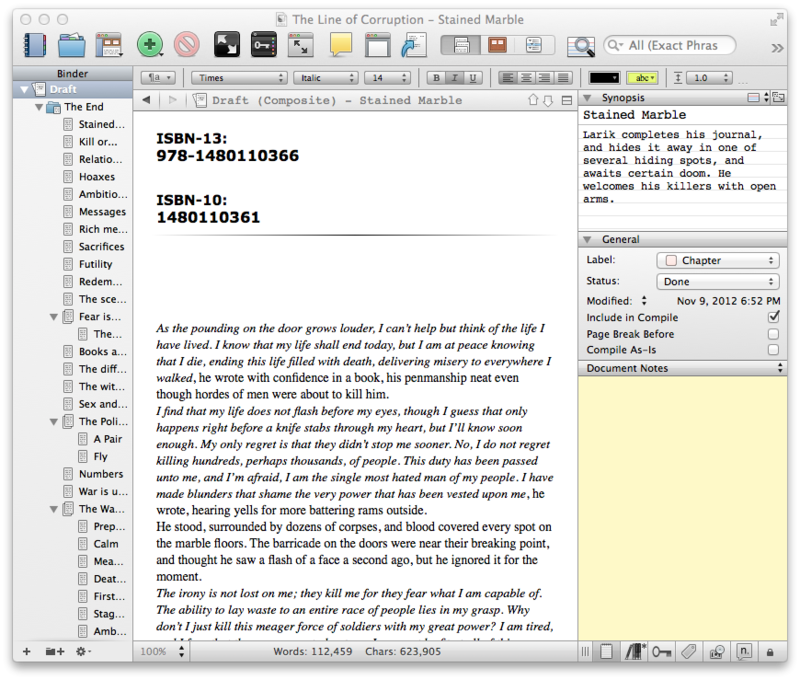 So, after awhile, I got used to Scrivener. I was still amazed by some of the simply awesome things it could do, but for the most part, I knew it like the back of my hand. Then… I found out I could write a script, a BBC Radio broadcast, and a play… Guess I never really knew the back of my hand after all. I went nuts with those options, too. I explored the script writing features, and I like to think that I have that down to a T, as well. I’ve yet to actually start writing a play, mostly because I haven’t a slightest clue how to write one. I haven’t made a radio broadcast yet, either, but I plan on exploring that avenue in the future. There’s also an option of writing a research paper, but hey. That’s what Word is for. I like to associate Scrivener with fiction writing, and research papers for school… That’s not my definition of fiction writing. I keep telling my sister to install Scrivener on her computer, but she won’t listen to me. To be honest, I’m kind of glad that she doesn’t listen to me. After all, it means I’d have to teach her how to use it when I barely know how to utilize it to a quarter of its full potential. So, there you have it. My thoughts on Scrivener. It’s all praise, I know, but that’s how I think of Scrivener. I could tell you its faults, but you could easily find that out with a quick google search. I, on the other hand, prefer to talk about all the good stuff. If you want to try out Scrivener, here’s the link to the website where you can download a free trial version of it. Oh, I forgot. You could also write the script for a comic book. I’ve explored that feature, too. And I like it quite a bit.